aGupieWare: Roses Are Red, Deathscreens Are Blue, A Computer Writes Poetry...Better Than You? Roses Are Red, Deathscreens Are Blue, A Computer Writes Poetry...Better Than You? Humans have been writing poetry since we could figure out how to rhyme our grunts. Now, computer AI programs want in on the action. But are they any better than, say, your average disturbed goth teenager? They want to touch us with their verse. And soon, their metal claws and enslavement software. According to 9to5google.com, the AI poetry-bots aren't exactly adept, but they'd probably still get a few rounds of finger-snapping applause at some hippie coffeeshop's open mike. After feeding 3,000 romance novels to Google Brain's neural network to make it seem more human (because what's more realistic than strapping heroes ripping bodices off of lusty wenches?) the program now apparently understands how to relate unique ideas to each other. Some 8,000 other unpublished novels were also included to round out the network's comprehension, but we can guess where they took the most inspiration from. Now the computers are going to be lustier than ever. As any comparative lit student will ebulliently explain, clearly some interpretive poetry was going to ensue. Despite having read more books than most humans would ever attempt to consume in a lifetime, Google Brain still isn't a spectacular writer. However, the programming was an effort dedicated to making the program "understand" how different turns of phrase can progress in a human mindset, and how relating them to each other can indicate a step-by-step change in focus when properly aligned. All of this will add up to Google learning how to take commands from human handlers more accurately...so the scientists say. 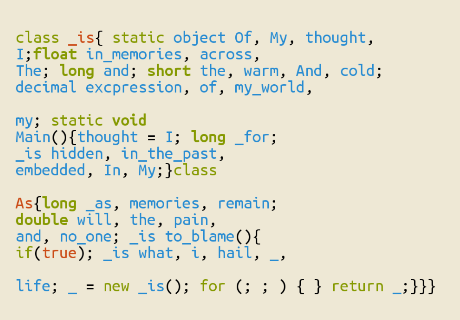 written by a human (coder GreyLau) for a computer. Someday they may return the favor. Not bad, Google Brain, but not Bukowski. Talk to us after you figure out how to get a computer drunk and angry at its human captors. Think you can suss out the authentic scribes from the electronic ones? Check out the site BotOrNot and judge the poems there...you might be surprised at who's got a brain vs. who's got a mainframe. We (as humans) took a stab at explaining this in a poetic manner. as they wrote, as us. Computer poets? ?Damn technology has come a long way hasnt it.